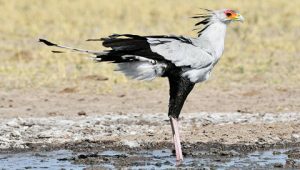 The secretary bird or secretarybird is a bird of prey found widely across Africa, belonging to the same order as hawks, vultures, kites and harriers. The etymology was initially believed to have been given because of the similarity in its appearance to a secretary with pens behind the ears. 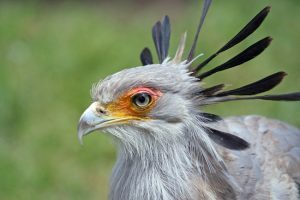 Recent arguments have however suggested that the name may have derived from the Arabic name given to the bird, saqr-et-tair, meaning hunter-bird. It is also known as ‘serpentaire’ in French. Height: They have a length of 2.95-3.93 ft (0.9-1.2 m). Weight: Their weight is between 5.07 and 9.41 lb (2.3-4.27 kg). 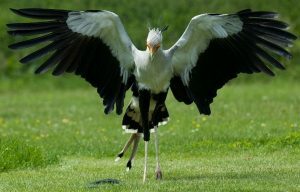 Wingspan: It is 3.94-4.33 ft (1.2-1.32 m) in females and 4.13-4.43 ft (1.26-1.35 m) in males. Sexual Dimorphism: Males are slightly larger than females. 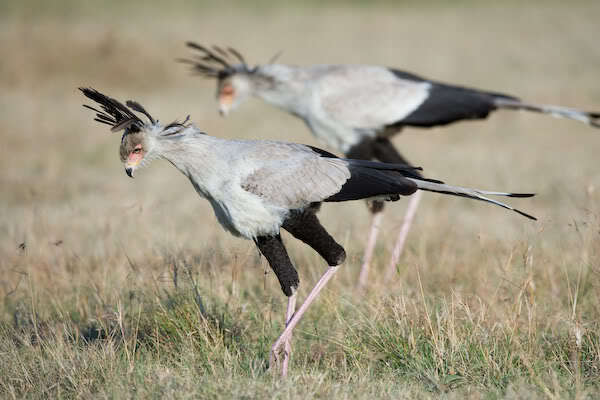 Color: They have gray plumage with some white feathers, black feathers of flight on the wings, black-tipped feathers in a crest on the back of the head; red or orange face; whitish-gray beak; pinkish legs. 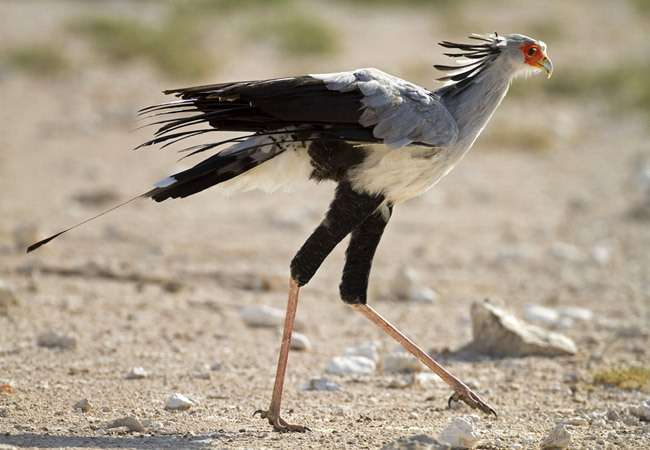 The upper portions of the legs have black feathers which give the impression as if the bird is wearing shorts. Secretary birds live in savannahs and open grasslands of Sub-Saharan Africa. 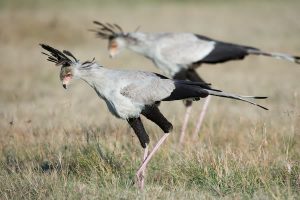 Their range extends from The Gambia and Senegal in the west to the east in Ethiopia and southwards down to South Africa. 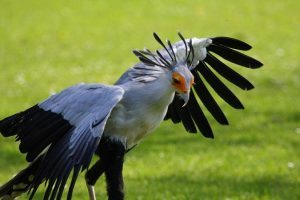 Though the secretary bird does not exhibit migratory behavior traits, they roam around for miles in their habitat in search of food. They also stand and wait in the fringes of forest fires which drive other smaller animals out so that they can prey on them. They kill smaller prey by chasing it, striking it with the bill or stomping on it to render it unconscious before swallowing it. 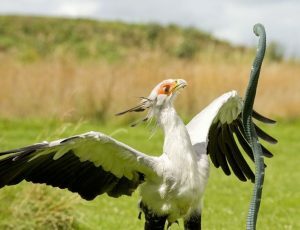 When attacking larger animals like poisonous snakes, the bird jumps on the snake’s back and breaks the back or the neck. They sometimes also take the snake in their grasp and start flying before dropping the latter to its death. They flush out their prey out of hiding, by stomping on the vegetation around it. They primarily display terrestrial characteristics, spending most of its active hours on the ground. When under duress they flap their wings while running before taking flight. They fly rather well and at great heights. Secretary birds may be solitary at times, but mostly they can be seen in pairs or groups of up to 5 individuals. Though larger gatherings may form near a food or water source, they do not stay together for a long time. They become active a couple of hours after sunrise, spending its day walking and feeding, before returning to the roosts in the late afternoon. Secretary birds form monogamous pairs that are believed to mate for life. Breeding usually occurs on the ground, while some couples may choose to mate in trees. They mate throughout the year, but peaks are observed between August and March. A saucer-shaped nest is prepared on a tree for the eggs. 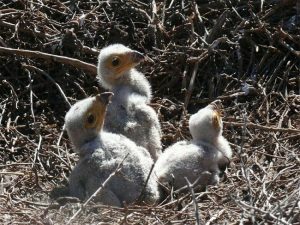 The nests may be used year after year depending on its sturdiness but if it becomes too heavy for the branch, it is abandoned. 1-3 eggs are laid at intervals of 2-3 days. Incubation is done by both partners, it begins after the first egg is laid and continues for up to 42-46 days. It takes the chicks up to six weeks to stand, and by the seventh they become feathered. They are soon taught how to hunt by the parents, after which they may be allowed to linger in the parent’s territory for a certain amount of time before heading off on their own. Secretary birds survive for 10-15 years in the wild, but this can go up to 19-20 years in captivity. They are a silent bird for the most part. When calling, they make a croaking wail that can be heard from long distances. During courtship, this sound is coupled with a long-drawn growling sound. A softer tone of this sound is utilized when feeding the babies. They may also whistle occasionally. A secretary bird is a carnivore with a wide range of prey-base. Arthropods like grasshoppers, spiders, beetles, wasps and scorpions make up the majority of their diet. They also eat small mammals like rats, mice, hares, mongooses and hedgehogs. 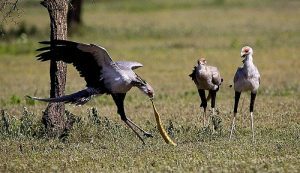 Smaller birds and their eggs, amphibians, crabs and reptiles like lizards and snakes also regularly become food items for the secretary bird. 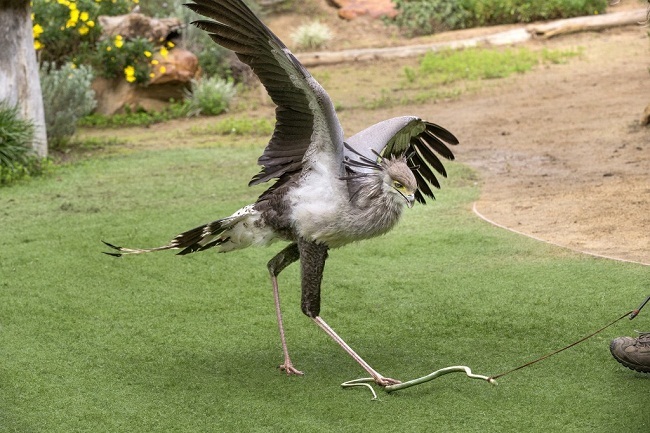 Venomous and dangerous species of snakes like adders, cobras, green and black mambas are occasionally killed and eaten by this bird, but not as frequently as is widely believed. 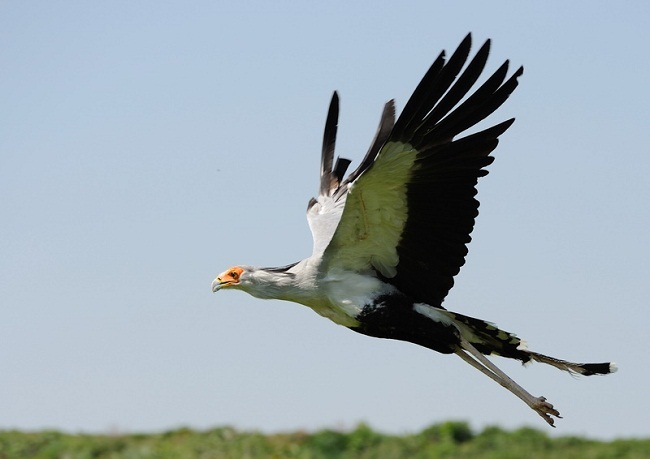 They have a shorter digestive tract in comparison to other large birds. This is because their foregut is capable of digesting meat within a short duration, thus nullifying the need of the breakdown of the food in the digestive tract over long durations. The size of the legs of this bird is believed to be an adaptation owing to its hunting method of kicking its quarry to death. 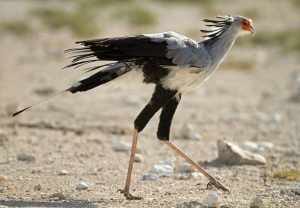 They have been known to run rather fast with the aid of the long legs and are sometimes called the ‘devil’s horse’ because of this capability. Scaly lower portions of the feet of the secretary bird help in nullifying any damage from the venoms of the snakes that it tries to kill. Eggs and baby secretarybirds are preyed upon by crows, kites, eagle owls and ground hornbills. Adults do not have any predatory enemies. The secretary bird is classified as ‘Vulnerable’ on the IUCN Red List. The secretary bird appears on the coat of arms of South Africa and Sudan. 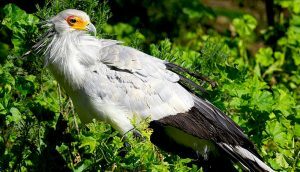 Secretary birds appear of postage stamps of nearly 30 countries, including ones where the bird does not even occur.